Just because you’re late, doesn’t mean you’re fashionable. Unless, of course, you’re Chance the Rapper—then, you’re always fashionable, and people tend to be a little more willing to meet the demands of your schedule. Such was the case on Monday evening, when the Chicago artist, philanthropist, and icon spoke to a packed auditorium at the Museum of Contemporary Arts. Originally planned for November, the event was rescheduled when Chance was offered the opportunity to host Saturday Night Live that week. Fans with tickets to hear him speak, however, were undeterred, and showed up en-masse to the rescheduled event after months of waiting. When Chance took the stage in camo overalls, Day-Glo green boots, and his signature 3 hat, the crowd erupted in euphoric cheers and applause: The hometown hero had arrived at last! Chance’s response illustrated the positive attitude for which he is so ubiquitously known. The intentionality with which Chance approaches his individual projects and his everyday life became a major theme of the talk. He spoke about his childhood aspirations to become like the artists who inspired him, such as Dave Chappelle, MC Hammer, and Kanye West (whom Chance eventually got to work with). Sticking to such a timeline, however, isn’t easy. Opportunities present themselves abruptly, and success is likewise fleeting once accomplished. With each achievement, explained Chance, comes a new perspective on one’s goals. “There’s space between all my projects because there’s a different kind of paradigm shift in my life at all these points,” Chance said. Yet Chance’s perception of success as something other than wealth and critical acclaim has remained constant; he measures it instead in terms of how much he boosts the people around him. When asked by an audience member about an emotional video released online in which the artist removed his three Grammy awards from their boxes while his young daughter gleefully climbed on him, Chance explained why he began tearing up at the end of the video. The talk wasn’t all serious reflection on Chance’s body of work; interspersed were moments of levity and discussions of Chance’s collaborations with other artists. Chance spoke about his friendship with the multitalented Donald Glover, whom he admires for his “cool, firm grasp on who he wants to be.” It has been rumored for years that Chance and Glover are collaborating on a mixtape—a rumor which, according to Chance, the two of them have continued to perpetuate without actually discussing the project with one another. 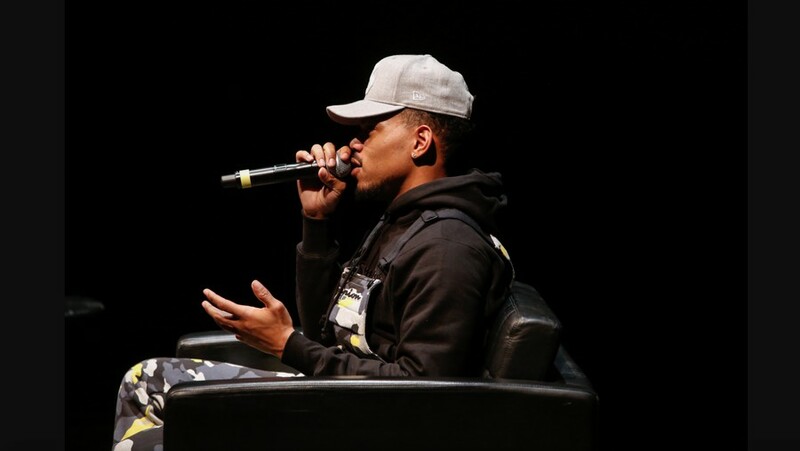 In response to an audience question about his experience working with West, Chance talked about the diverse activity at his recording studios—including, apparently, a terrace filled with mysterious people on laptops, working on ambitious projects. Some of Chance’s comments were also more critical, including those aimed at comedian Kevin Hart. In the episode of Saturday Night Live that Chance hosted, he appeared in a self-written sketch that used Batman as a humorous vehicle for criticizing racist vigilantism and police brutality. Several weeks later, Hart also hosted SNL and appeared in a sketch featuring a black Batman who was unnecessarily harassed by the police. At the end, however, the police incidentally find cocaine in Batman’s possession. “Where is the political statement? What are you saying?” Chance asked incredulously. Indeed, Chance refuses to shy away from honest expression, and affirmed during the talk his commitment to voicing one’s beliefs in the face of opposition. Chance chose to end the interview by expressing one final point: his unflinching dedication to Chicago and its residents. 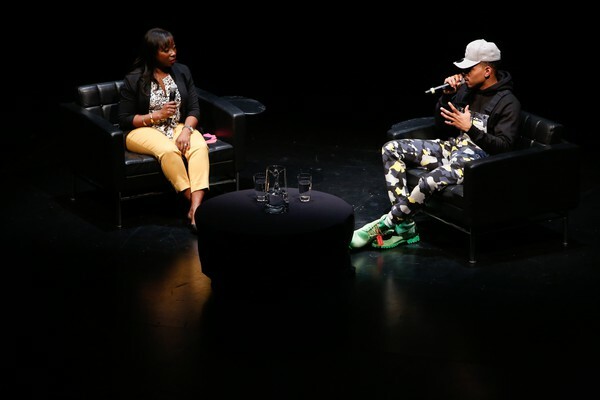 Indeed, Chance and his charity, SocialWorks, have given back tremendously to Chicago’s youth. Yet while SocialWorks has donated millions to the Chicago public school system, observing the inner workings of CPS and city government helped Chance discover that personal involvement and participation can be more valuable than money alone. He called on audience members to improve the city by taking active roles in the leadership of their wards, neighborhoods, and even their blocks. But he assured them that they would not be alone. Chance followed up this resounding pledge with one last thought.